Two swimming strokes—one that pulls through the water like a boat paddle and another that whirls to the side like a propeller—are commonly used by athletes training for the Olympic Games. But elite swimmers and their coaches have long argued over which arm motion is more likely to propel an aquatic star toward a medal. 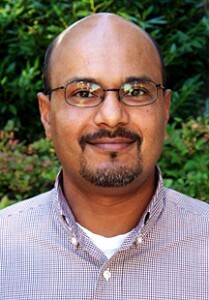 Mittal, a recreational swimmer, joined the Johns Hopkins faculty in 2009. His research into motion through water began almost a decade ago when, while based at George Washington University, he was awarded a U.S. Navy grant to figure out how fish use their fins to swim so well. To tackle this task, Mittal’s team developed software and computer models to study the movement of marine animals. Mittal later contacted USA Swimming to see if he might use these high-tech tools to crack the secrets of elite swimmers. Russell Mark, the biomechanics coordinator of USA Swimming, was intrigued, and he provided Mittal’s team with underwater videos of top swimmers and startup funding. With this support, Mittal and Loebbecke collaborated on studies of the “dolphin kick” used by many Olympic-caliber swimmers, including medalist Michael Phelps. After completing that study for USA Swimming, Mittal’s team turned its attention to the debate among top coaches about the merits of deep catch and sculling strokes. In the 1960s, the sculling stroke gained popularity thanks to the late James “Doc” Counsilman, then the head men’s swimming coach at Indiana University. Counsilman, highly regarded for his science-based approach to swimming stroke mechanics, also was head coach of the U.S. men’s swim team that won a combined 21 gold medals in the 1964 and 1976 Olympic Games. Counsilman encouraged his swimmers to use the propeller-like sculling stroke, in which the elbow is raised to a higher position and the arm moves inward and outward in an S-shaped, propeller-like pattern. Mittal has shared his findings with USA Swimming. He also pointed out that many top swimmers use variations of the classic deep catch and sculling strokes. Outside of competitive swimming, Mittal’s findings could be useful in designing exoskeleton suits that the U.S. Navy is seeking to help elite military forces swim more quickly and efficiently. Color digital video available; contact Phil Sneiderman.